Note: Hat is photoshopped. Keep a distance of 25+ yards away from Elk. We wanted to take a moment to feature (and thank!) the people behind the scenes in Yellowstone that help spread the gift cheer: our retail department. Not only do they run 11 different stores in the park, they also run our online gift store. One aspect in particular, brings visitors joy throughout the year: mail orders. Online Gifts store: This site features many popular items from apparel to huckleberry treats, books, jewelry, or products Made In the USA. Items are often featured on sale in our e-mails. “Ship it Home”. Not enough room in your suitcase to take home your Yellowstone gifts? No problem, visitors who make purchases in our in-park stores can ask Sales Associates to ship their items home. The shops send the merchandise and paperwork to Gardiner where they are boxed up and shipped. During the summer months, there is an extra person assigned to Mail Order, to handle the amazing number of visitors who utilize this “ship it home” option. The final part is handling the calls and emails from past shoppers to return an item for a different size or someone looking for a gift they saw, but didn’t purchase while in Yellowstone. This involves a lot of Nancy Drew detective work on the part of staff. And we can’t talk about mail order without highlighting the star behind the scenes. Debby Standaert-Rhoades has been keeping orders filled for 12 years! Debby’s day begins with retrieving orders from the website and filling any two-day express orders immediately. Those product inquiries via e-mail are not uncommon and occupy much of Debby’s time. Mornings are spent keeping up with order fulfillment and working with FedEx for shipping. The afternoons are used to pack store purchases from the gift shops from May – Oct. It’s a non-stop job most days. “I moved to Yellowstone 27 years ago for the summer of 1989 and never intended to leave if that was possible. I already knew that Yellowstone was where I belonged” says Debby. Below is a photo of Debby packing up orders for the day. While email promotions go out throughout the season, the winter season and holiday time means more shopping. E-mails can generate 200 orders a day or more! The range of tasks, from online and phone order fulfillment to special packaging and shipping related to fragile items certainly makes for very busy, yet rewarding days. “I was hooked from the 1st time I visited at 13 in 1973 and saw a bison walking in the steam on Fountain Flats. I started my 1st summer working in the Old Faithful Inn gift shop and worked there 13 summers in the Gallery and as gift shop manager 2 summers, 8 winters at the Old Faithful Snow Lodge, 5 winters at the Mammoth Hotel. I met my future husband, John Rhoades in my 1st summer working in the park and we are still married 25 years later. 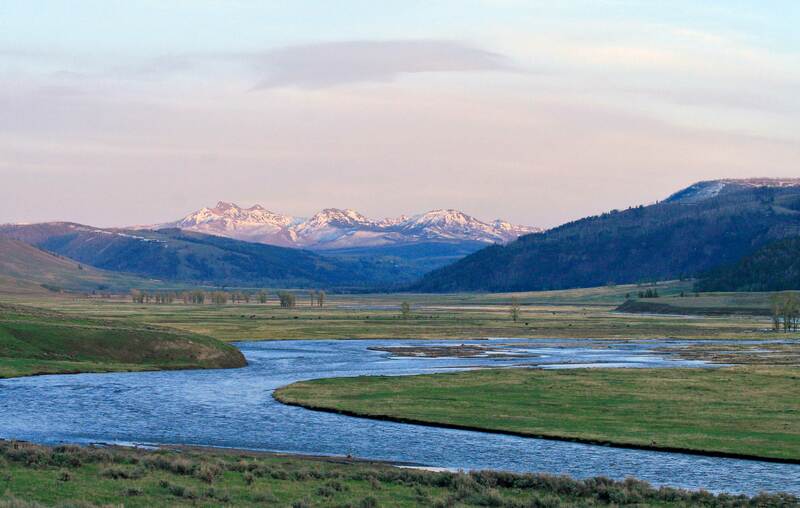 I never get tired of living in Yellowstone and find it endlessly fascinating,” Debby says. So next time you buy some Yellowstone gifts, you can thank Debby and our wonderful retail department for helping send some Yellowstone cheer from our home to yours. Thanks to Kate Spangler, the Distribution Center Staff, and Lori Todd for contributing to this article!